Come Join Our Sisterhood! Four women at a lingerie sale have nothing in common but a black lace bra and memory loss, hot flashes, night sweats, and more! This hilarious musical parody set to classic tunes from the 60’s, 70’s, and 80’s will have you cheering and dancing in the aisles! See what audiences worldwide have been laughing about for over 16 years! Nearly 11 million people in 13 countries (more than 350 cities) have enjoyed this unique theatre experience. And Men love it too! Men in the audience can relate and understand this time in the lives of their wives, sisters or mothers. 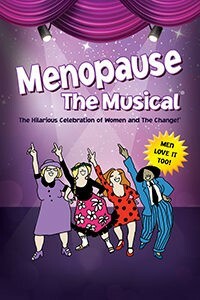 Winner of multiple awards around the world, Menopause The Musical is a theatrical experience not to be missed! We have wonderful seats in rows 4, 5 & 6. A delicious lunch featuring Broccoli and Cauliflower Salad, Fresh Breads, Chicken Monterey, Yukon Gold Potato Wedges, Fresh Julienne Vegetables and Pecan Turtle Ball Sundae is included. Minimal walking.